Develop and maintain strong professional relationships with clients and facilitate open lines of communication via e-mail, phone or face to face. Perform site visits, site evaluations, and formal meetings with our clients to ensure a high level of quality and service. Prepare estimates and proposals for presentation to clients and potential clients. Present enhancement ideas to existing clients, maximizing sales opportunities, and improving our client’s properties. Educate clients on current landscaping trends and practices. Assist in resolving issues, problems or concerns with our clients, expedite client service when needed. Develop strong relationships with Schill team members to ensure that customer service and production teams are coordinated on serving the needs of our clients. A degree in landscape management, horticulture, or equivalent experience in property management or a customer service related field. 5 years’ experience in the landscape management field. ASCA, CSP, and Landscape Industry Certification preferred. Strong computer skills in Microsoft Office Suite and other CRM systems. 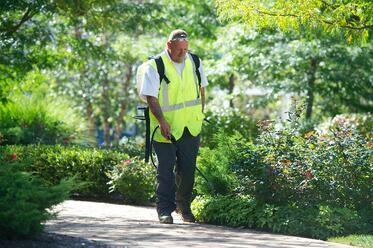 An expert knowledge of landscape maintenance programs, knowledge of plant material and installation standards. Exceptional communication skills; the ability to communicate clearly both verbally and in writing with co-workers and clients. Bilingual Spanish a plus. A positive attitude and a knack for working in a cooperative team environment. Must be extremely motivated and highly organized. Excellent interpersonal skills, outgoing personality.